Moorthy’s story is not different from many – he had to stop his school-education midway due to poverty and instead, work as a child labourer. But what made the difference was his perseverance and relentless efforts, which has ensured that he has now risen to the level of an MBBS doctor. Born in Ooththankarai village in Krishnagiri district of Tamil Nadu, Moorthy’s father was a labourer. He was pursuing his school education in his grandmother’s place of Kailayapuram in Dharmapuri district, where his family was also staying. But poor living conditions forced them to shift to Bangalore (Bengaluru) city. Moorthy had to abandon his schooling, move to Bengaluru and work in construction sites along with his family members. He returned to his place after one-and-a-half years and joined the child labour welfare school as a Class 7 student. His Class 9 and 10 schooling were in Tamil medium at the Oothtaankarai government school, where he scored 459 out of 500 in the SSLC examination and stood first in the district among the students who pursued studies after being child labourers. This prompted the then district collector Amudha and Dharmapuri District officials of National Child labour project to make arrangements for Moorthy to continue his free education in Vijaya Vidhyalaya Boys Higher Secondary School in Dharmapuri. Without any tuition, as he could not afford the same, he still scored 1,123 out of 1,200 in Class 12 exams. His cut-off mark was 193 for MBBS admission. 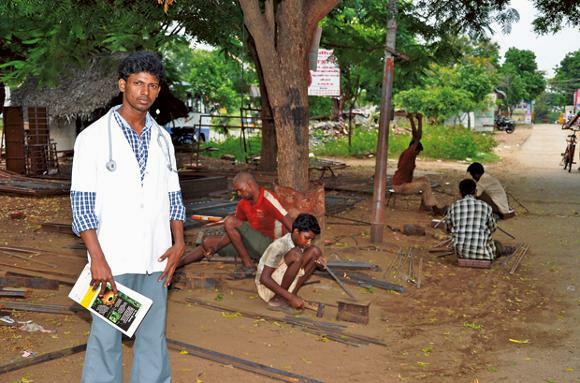 Being a Dalit, he got a seat in the Mohan Kumaramangalam Government Medical College, Salem in 2011. “ I received necessary support from the Dharmapuri District officials of National Child labour project. Though I managed to get admission in government medical college in 2011, my extremely poor family living in a thatched hut, had no means of providing for my studies. However, learning about my condition, Dr. Manikantan, who is running the Sugam hospital in Omalur and his wife Mrs. Uma Maheshwari came forward to bear the cost of my education. Initially, I found it difficult to study in the English medium in college, since I was a Tamil medium student. However, I managed to overcome the problem in about six months, started doing well in my classes and now have a medical degree as well,” says Moorthy. “After that, I was working part-time in the Thiru hospital run by Dr. ThiruvarulSelvan in Salem for a few months, and was also preparing simultaneously for my entrance examination for the post-graduation medical course. Now I am staying in Chennai and undergoing training in a private coaching centre, thanks to his kind assistance. I dream of doing either MD General Medicine or MS Ortho. If I am able to get admission in post-graduation, I can then try to get a scholarship and on successful completion of the course, join government service,” he sounds quite hopeful and confident. “My brother Bhoopalan is studying diploma to become a dialysis technician, whereas we need to celebrate the marriage of my younger sister, who has not completed her school education. I have to support my mother too and if I get employment, all these can be well taken care of,” adds Dr. Moorthy, as he prepares himself to take the entrance examinations for post-graduation studies in medicine scheduled to be held in this November and December, with confidence.